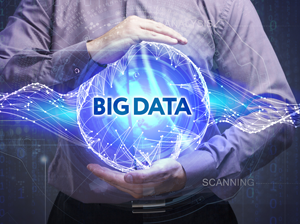 Big Data refers to extremely large data sets of varying types of data – structured, unstructured, and semi-structured – that can be collected, stored, and later analyzed to provide insights for organizations. Big Data’s promise depends on how the data is managed. In the past data was organized in relational models, sometimes within data warehouses, and controlled through various ETL (Extract, Transform, and Load) processes. This strategy does not work well with Big Data; the size and complexity of the datasets have caused enterprises to adopt new processes and different approaches (such as NoSQL or non-relational databases) that have drastically changed many time-honored Data Management practices. Volume: The amount of data. Often this consists of thousands of instances or billions of records. Velocity: The speed at which data is captured, generated, or shared. This can be distributed and analyzed in real-time. Variety/Variability: Forms in which data is captured or delivered. These can take different data structures that are often inconsistent within or across data sets. Viscosity: The difficulty to use or integrate the data. Volatility: The timeliness of the data. Its changeability. Veracity: The credibility of the data. Find and act on business opportunities. Define predictive and prescriptive models that anticipate customer needs, improve business interaction, and ultimately affect the ROI of a business. Target customers in more efficient ways. Optimize decision-making and business processes. Improve data security, compliance, and regulation.